This year saw me returning to the Ironman Distance after a gap of 5 years. 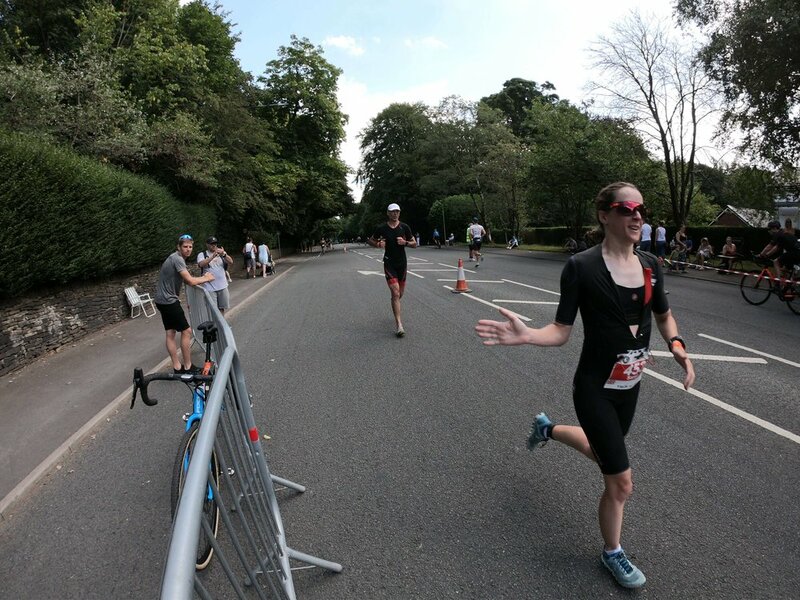 During that time I have learned a lot about triathlon and racing, so I was hoping to put my knowledge to good use, and beat my previous best time of 14.41 set at Outlaw in 2012, albeit Bolton is a completely different course! 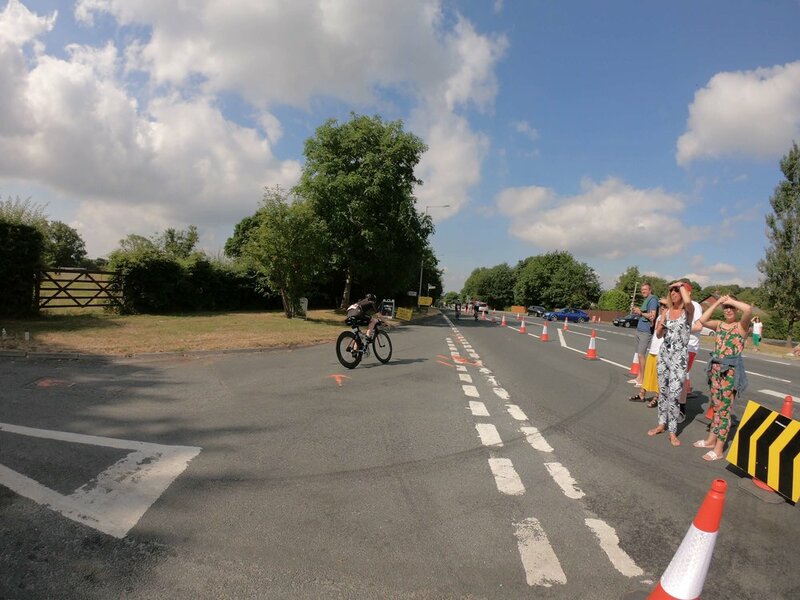 During the last few months, I had made sure that I’d ridden the bike course several times, and also swam at Pennington Flash, so as to familiarize myself as much as possible with what was to come. A change of bike course due to the fires on Winter Hill put a bit of a new spin on things, but I took the time on Thursday to drive the new section of the course. It was a tough bit of road, very technical on the descent, lots of narrow twisty lanes, and a testing steep climb. 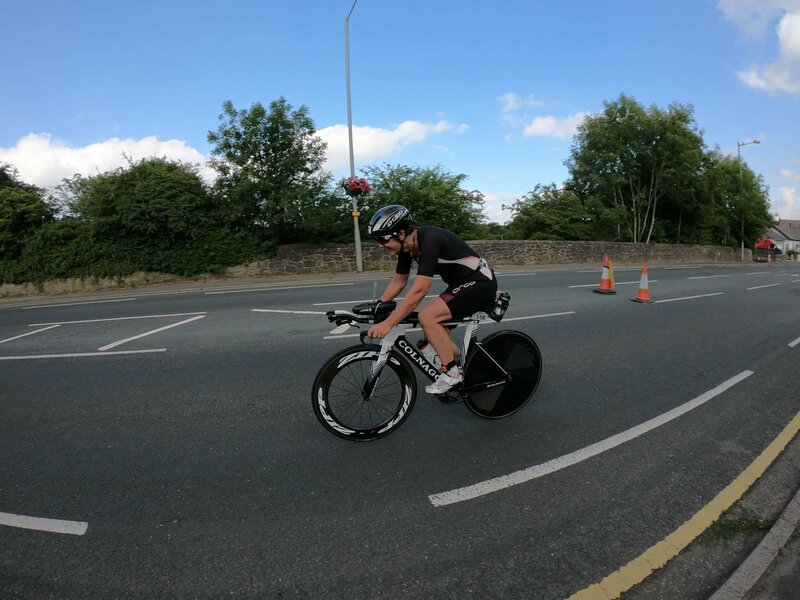 I was a little disappointed, as the course now missed out my favourite bit from Belmont, through Abbey Village and Wheelton, where I felt I could make up a lot of time by getting aero on my TT bike, and going for it. But never mind, at least I was prepared! I met up with Sarah for the race briefing and bike racking on Saturday morning, and then it was home to rest up as much as possible, ready for the early start the next day. After a super early 3.30am breakfast, we set off for Pennington Flash for the swim start. Athletes were allowed access to our bikes, so I loaded up the bike with all my food and drink, and got myself mentally prepared for the day. The swim was a self-seeded rolling start, with your timing chip starting as you crossed the mat to enter the water. I placed myself at a predicted swim time of around 1hrs 30mins, which is faster than I anticipated, but meant that I wasn’t at the very back either. The swim started at 6am, and I entered the water about 10mins later. My sole focus during the swim was to stay relaxed and get through it. I had no illusions about achieving any particular goal or time, and when I finally finished the second lap, my husband Paul said that he was very relieved to see me climb out with a big smile on my face. Although I anticipated a lot of physical challenges through the rest of the race, I knew I’d done the hardest bit from a purely mental point of view. It felt good to get on my bike, and I started to work my way up the field, passing many as I ticked off the miles. I concentrated on eating regularly and keeping drinking. It was nice to have some familiar faces out on the course cheering me on. The course was tough, technical and hilly, but I was pleased to complete it in a good time of 5:58, which was the 3rd fastest bike split in my Age group. I got off the bike and entered T2. I took a couple of minutes to compose myself in the transition tent, then, I was off, with just the small matter of a marathon to complete. The marathon was run over four laps around Bolton Town Centre. My plan was to set a steady pace that I could hold for the duration, so with this in mind I set off “easy” and feeling good. I had a strategy of picking up two cups of water and one electrolyte drink from most feed stations. One cup of water went over my head to cool me down, and then a drink of electrolyte followed by a drink of water. This seemed to work well, as my energy levels remained high for at least the first two laps of the four lap run. As I started lap 3, I started to feel the fatigue set in my legs, and it was becoming harder to maintain the pace I’d set myself. I dug in and tried to keep it going. The crowd were fantastic, with lots of cheers of support, which helped a lot. I was aware that I was slowing down as I got to around 18 or 19 miles, and from then on it became a mental battle. I was determined to keep running, albeit at a much slower pace. The last 3 miles were particularly tough going, but I reconciled this with myself, they are supposed to be like that – it means you’ve given it everything you’ve got. I was delighted to finally run down the famous Ironman finishing chute, and hear those words, “Wendy Drake You are an Ironman”. My final finishing time was 13:29, placing 6th in my Age Group. I did qualify for a roll down place at the Ironman World Championships in Kona, Hawaii, but unfortunately I won’t be going! As an athlete and a coach I always look to challenge myself and my athletes both physically and mentally so having undertaken many triathlon distances and formats over the last 6 years 2018 seemed like the right time to compete in an Ironman event. Being within 30 minutes of Bolton, and only a couple of miles from the bike course, it seemed logical to choose this one as it gave me the ability to specifically train for the event on the roads being used.Leading up to the event, training had been going well with plenty of time on the roads but with recent hot weather one of the main hills (Sheephouse Lane) on the route was closed due to a moorland fire which local fire brigades were working on round the clock to extinguish. 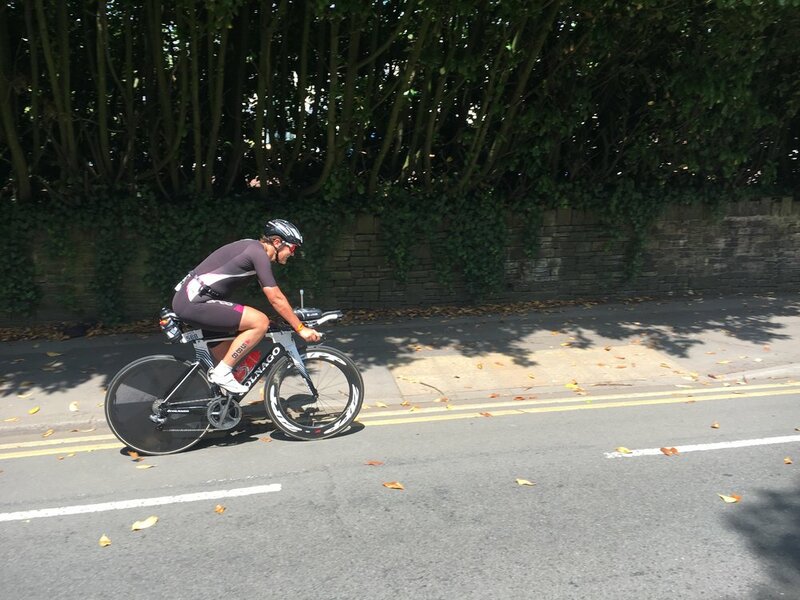 Ironman UK organisers had to make a tough decision with regards the route and decided the best option available to allow the event to go ahead would be to re-route the bike course making it a total of 95 miles instead of the standard 112miles. 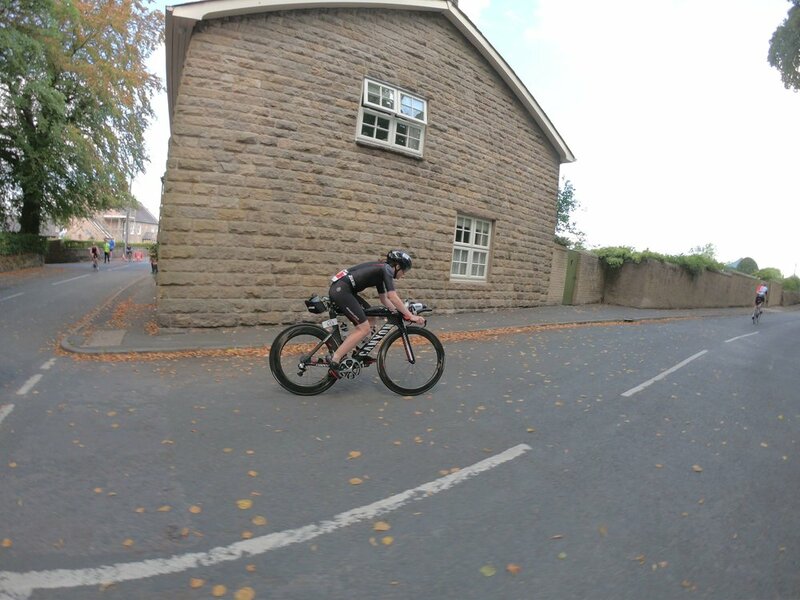 Initially I was disappointed but finding out the route we would now be racing on and that it was going to climb one of the steepest hills (Anglezarke) in the area twice, I knew it wasn’t going to be any easier. Race morning came and having racked my bike and dropped my trainers in T2 the day before I only had to attach my race nutrition to my bike, warmup and get in my wetsuit before the 6am start. Around 5.45am I went and placed myself in the holding pen at the 55min banner and after the pro athletes were introduced we were slowly moved forward until bang on 6am I was in the water. The swim is 2 laps with an ‘Australian exit’ where you get out and run back round to the entry point. Swimming out to the first buoy I got the inevitable hits from head to toe but having expected these I didn’t allow them to distract me. Sighting on the way back was difficult as the sun was rising but luckily there were people in front who I was able to follow. I was able to get a clear run into the exit and was soon on my feet running round to get back in for another lap. However just as I was about to drop back in I slipped on the plastic walkway and went down hard taking most of the hit to my left hand. Back in the water I was able to find a pair of hips to swim on which definitely helped and made the second lap pass quite quickly. Having predominantly raced standard and sprint events, transitions are a good place to make up some time and I didn’t want that to lapse just because I was ‘going long’ so with that in mind I got into the transition tent (another new experience), found my bag with helmet and glasses, got my wetsuit in the bag and was soon out to my bike. Going into the event I knew it wasn’t going to be like any other race I’d done before. Although I was going there with pre-determined goals of what I would like to achieve and would be racing throughout, unlike the sprint and standard races, I felt the race was more about my mentality opposed to the close contact physical racing I’ve experienced before. 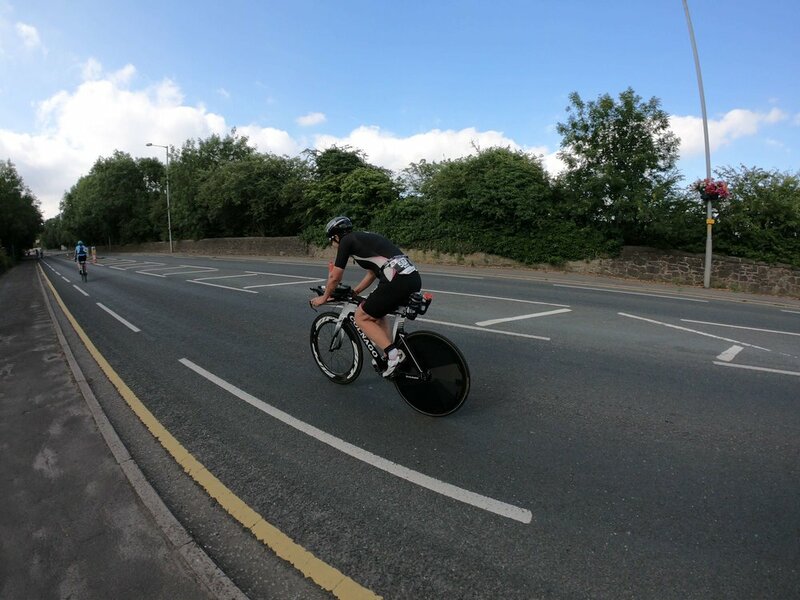 Now don’t get me wrong Ironman is very much a physical race, being on the move for 10+ house is never going to be ‘easy’ but you are by yourself for the majority of the day and keeping a positive attitude will play an important role in getting the best performance on the day. So onto the bike, and with approx 15miles before joining the loop proper it gave me time to get into the riding before I hit the new climb at Anglezarke. Even early on there was plenty of support on the course and it’s easy to get carried away with everyone cheering but knowing there was still a long way to go I maintained my effort level. In previous, shorter races, I have been a bit lapse with my nutrition and luckily only a handful of times has it majorly impacted my race so for an event of this length it was imperative that I kept on top of this throughout. I could go into more detail about the bike route and the support in certain places but I was focused on me, how I was feeling and trying to be as efficient as possible. Finishing the bike route I was feeling good and looking forward to getting running although from reccing the run route I knew there were a couple of inclines that would test me. 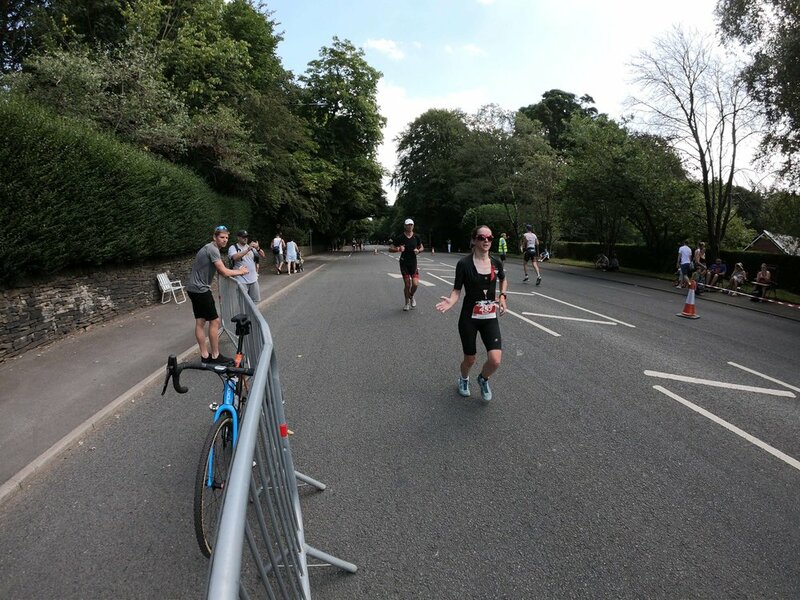 The run at Ironman UK is 4 laps, now using Queens Park on the outskirts of the town centre and about 3-4 miles on Chorley New Road. The first lap for me felt good, really felt like I was flowing, body was feeling good and energy levels were up. Being so close to support again was great and actually being able to see people who were there to support me really helped. My goal before the event was to try and run a sub 4 hour marathon and I was determined and focused to achieve this. Starting the second lap and climbing the incline through the park my energy levels were starting to wane and it was at this time, and for those that know me well, my saviour arrived at a aid station on a silver tray. SALTED NACHOS were my absolute godsend and I started to look forward to these. I could have quite easily allowed myself to walk through the aid stations or on the incline through the park but I wasn’t going to give myself that opportunity, I wanted to feel like I was moving forward at all times and remain focussed on staying relaxed, in the moment and working towards my target time. Coming into the finish chute I knew the last 6 years of racing had put me in a place mentally where I was able to arrive confident in my ability to execute the race to the best of my ability and I’m so happy I was able to do this and come away with a performance to be proud of. As with any event the support given by family and friends, not just at the event but the time before, during and after is very much appreciated and only those that have been there through it all know how much it means to have them with me.